Sometimes in the spring there is as much "unplanting" as planting going on. The weeds are just as excited about spring as any other plant and have taken off. They want to get firmly established and if possible bloom and set seed before I find them. They're in a big hurry because they "know" when I find them, I will be unplanting them! Can you spot the weed in the picture above? Bonus points if you can also identify it for me because I've forgotten the name of it, but I know it is a weed and it came up out of nowhere. I believe it was not there yesterday, but grew out of nothing overnight. Hint, the two plants that are "keepers" in the picture are a gold foliage Spiderwort (Tradescantia 'Blue and Gold') and a tall phlox (Phlox paniculata), which looks a little anemic. I'll have to keep this advice in mind as I get down to some serious weeding soon. I'll also be doing some serious shrub removal in the next few days. Remember my forsythia (Forsythia x media 'Arnold Dwarf') that hadn't bloomed in nearly 10 years? This is what they look like now. They suffered mightily in the winter of April '07, and I'm going to finish them off soon. When they look so bad, I don't mind yanking them out and clearing out those weeds. Can you believe those weeds that I've let grow in there? You all might think I'm a lazy gardener after seeing that mess. And sometimes I am lazy, aren't you? 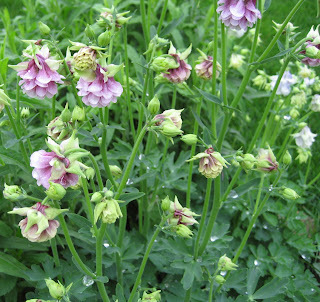 But one plant I won't be pulling out is this double columbine, Aquilegia vulgaris 'Tower Pink'. The "brother" plant is 'Tower Blue' which you can see over on the right. I started both from seed in 2001, and they've come back reliably every year. They get to stay as long as they want! Carol — I love columbines and am impressed that you started these from seeds. I've tried various columbines in my Austin garden and the only one I've had any success with is the native Hinkley's columbine; there's a native red columbine too but I've kiilled it enough that, at least for now, I've given up and am sticking with the yellow. The doubles are amazing, though. Just look at the new bed you will have when you pull out the forsythia!! More room for perennials! 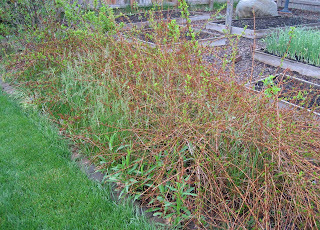 Columbines pretty, Forsythia ugly! Out, out, out with it. And the weeds too. They can grow so quickly in such a short time! Excellent advice by anon, must keep that in mind! Ooh - columbines, and double ones at that. I have a small addiction problem with columbines and I will spread their seeds pretty much anywhere. I'm trying to be good and keep them out of a few of my gardens, but its so hard! And I'm guessing the weed is the lush looking tall weed on the bottom left - the weeds always look the best in the garden, don't they! I've been doing a fair amount of unplanting here, The bindweed is already trying to assert itself. That was a battle I fought all summer last year, and it looks like this year will be more of the same. 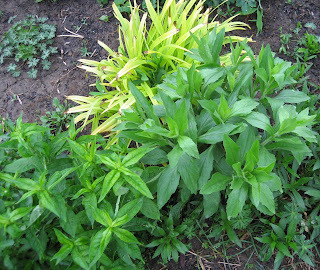 I'm guessing that the weed is the one in front of the Tradescantia, on the right. I think I have some of those too. 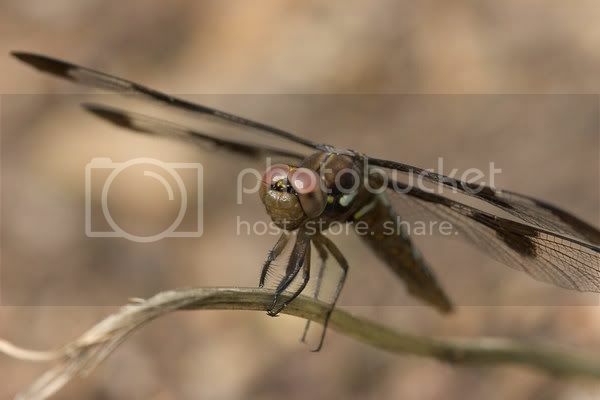 I recently heard a variaton on the weed ID quote - if you can't tell the weeds from the garden plants, just pull up everything and the weeds are the ones that come back. I love the quote - how often have you realised just too late that what you just yanked out was actually what you were trying to grow? .... or is it just me?? Columbines are so beautiful. I´m trying to grow some from seeds at first time this year. They are still very tiny, but our spring has just begun and weather is still cold. Your garden looks lovely. I'm with the ones that say it is in the lower right, and I think it is in the chrysanthemum family, or what used to be the chrysanthemum family. Perhaps daisy fleabane? I hate it when the weeds take over, too, Carol! I must tell you I am very lazy-about small chores. I don't get on top of every weed and soon they do take over! Your columbines are so lovely and fresh looking! Susan...The double columbine, as I recall, seemed fairly easy to start from seed. If I had better records, I could tell you if it bloomed the 1st or 2nd year and might be worth trying in your zone. Ginger... Thanks for the encouragement. It will be more room to plant something else! Layanee... I love the columbines, too. Yolanda Elizabet... I heartily agree, and hope to pull those all out in a few days. I'll take a picture when it's done and replanted with something else. Natalie... You could be addicted to worse than columbine, keep sowing those seeds! Colleen... I think bindweed is one of the worst of all the weeds. Almost impossible to get rid of it. And thanks for the compliment on my columbine scene! Entangled... Lower right is correct on the weed. I'll probably find out first hand on that revised weed rule! Sue Swift... It is not just you, I think every gardener has pulled out the wrong plant! Kylee... Yes, the plant in the upper left IS a weed, but it wasn't one of the three plants I described. There's still another weed in there! Sanni... Good luck with your columbine from seed, I think you will soon be enjoying some blooms. Kathy... Lower right is correct. I can't argue one way or another if it is in the chrysanthemum family or not. I'm just not sure. Sissy... I don't know of any gardener who stays current on their weeding! Thanks all for the comments and kind words! Yay on the forsythia going, since they don't make you happy! Any ideas yet what you will plant in its place?